Gomer and Goober: Let's Hear it For Goober! I've put off writing this particular post because I didn't want to make value judgments between the two characters. Although I don't personally understand why Gomer was so hugely popular (enough to earn him his own show), Jim Nabors is a decent character actor, and Gomer was a fresh addition to The Andy Griffith Show. 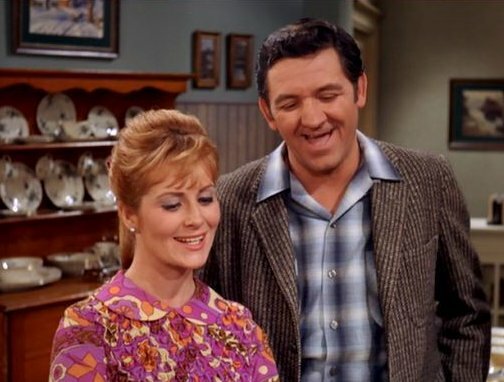 The later non-Don-Knotts (and non-Gomer) seasons are not as good as the earlier seasons, as many critics and fans of the show (including me) will attest. 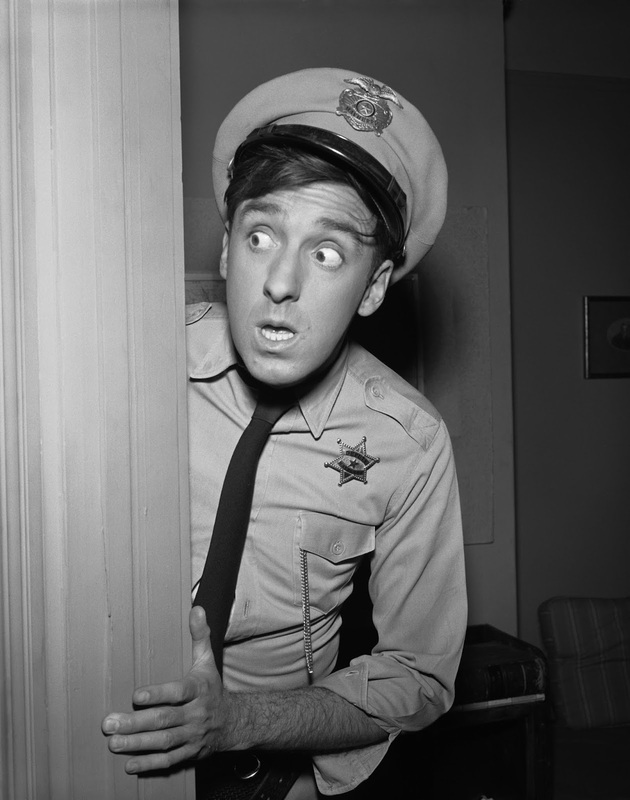 Actors like Andy Griffith require someone to act against. 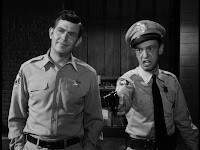 Without Don Knotts, Andy Griffith as Andy Taylor continued as credible straight-man to the town's idiosyncratic citizens (Howard, Floyd). 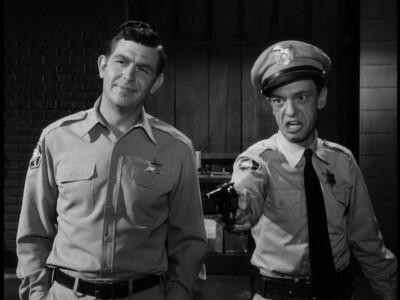 But Don Knotts was the perfect foil--plus a sheer comedic genius in his own right--so his absence is noticeable, and Andy Griffith as Andy Taylor is a little off his game. The latter seasons did produce decent episodes, however, and this is where I must put in a word for Goober. 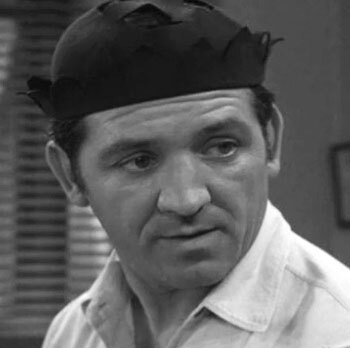 Although Goober is often seen as part of the decline, replacing the "better" Gomer as the town jester, he has always had a charm of his own for me. He reminds me of Dauber from Coach, being sweet, physically down-to-earth, and quite good at his job. Unlike Gomer, who is perceived as a clumsy innocent (more intuitive than Barney and less likely to shoot off his foot but actually far less efficient), Goober can do all the things he is supposed to do, like take apart a car inside the court house. Actually, Goober is rather like Dauber plus all of Coach's players rolled into one. My favorite Goober episode occurs in the last season when he ends up dating a woman with a Ph.D. that he met through a service. The "computer" match is entirely believable. Goober is a warm personality, a sweet-heart whose lack of "smarts" is the result of lack of education, not lack of interest or capacity. While Gomer seems to stumble over the truth, Goober, his cousin, seems to have instinctive commonsense, not to mention a sense that the world is in fact more complicated than so-called "smarter" people realize. When Goober explains to Opie how he filled out the dating service's questionnaire, it is clear to the teen-Opie that Goober refused to accept the socially-acceptable interpretation of the questions. But Goober, like many male Ph.D. holders I know, argues against multiple-choice questions: Why can't all the answers be right? Why shouldn't there be more options? Interestingly enough, the episode also points out--and marriage experts now agree--that superficial resemblances (we both like art, we both like opera) are not entirely helpful in determining what actually brings people together. How Goober and the Ph.D.-wielding woman interact actually matters more. Both Gomer and Goober blunder when faced with more worldly characters, including Andy, who supposedly know what's what. They doesn't mean Gomer and Goober are wrong in their assessments. The two cousins fall into the trope of canny dopes, yet they are quite different in interpretation, proving that a trope is a useful starting place, never an end point.